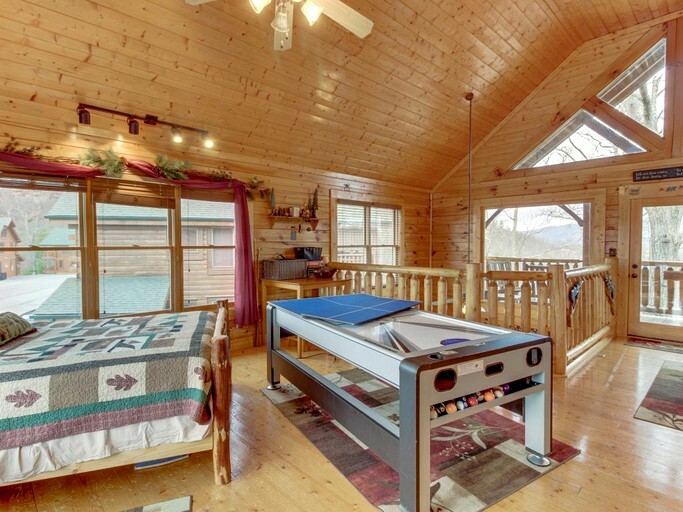 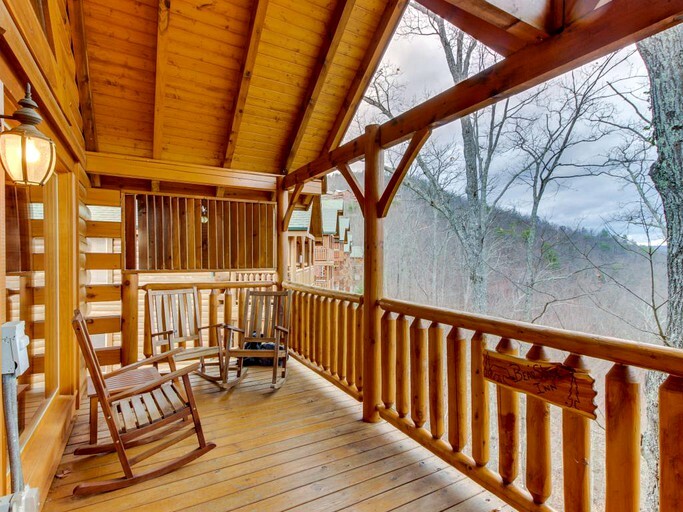 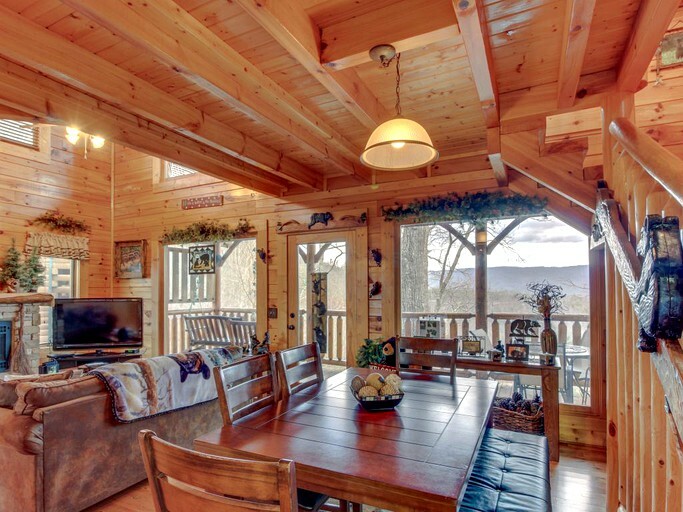 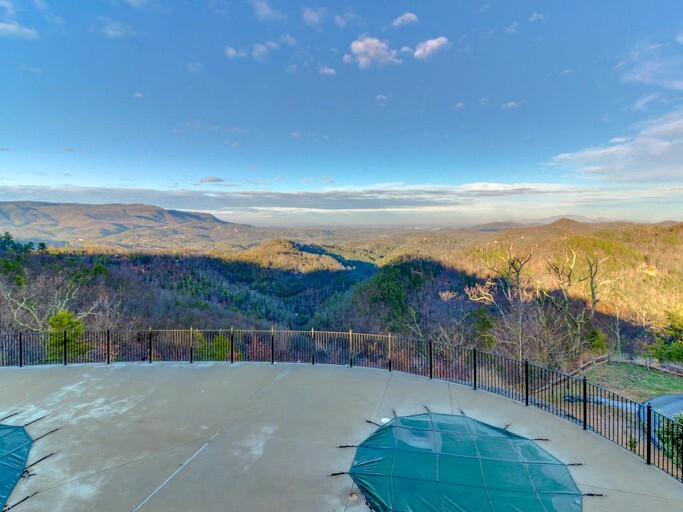 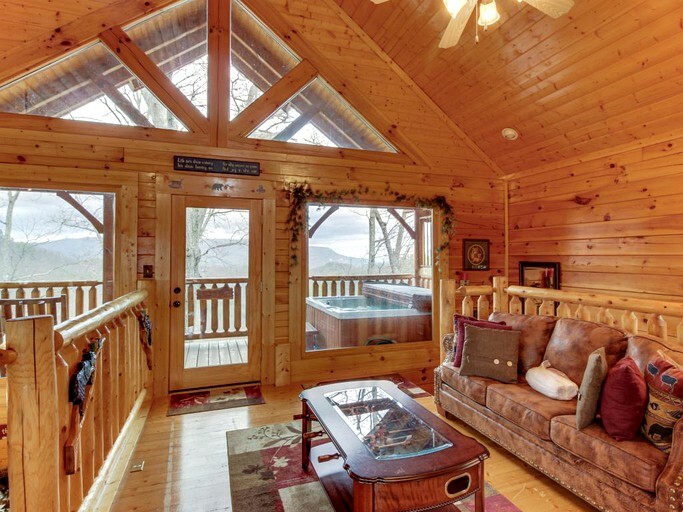 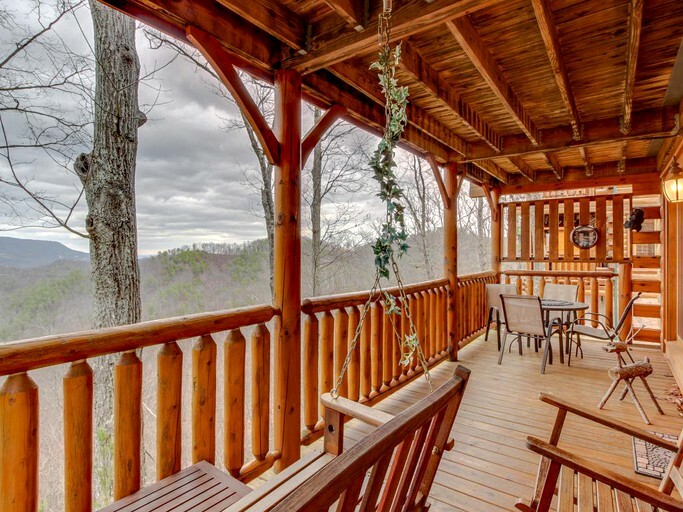 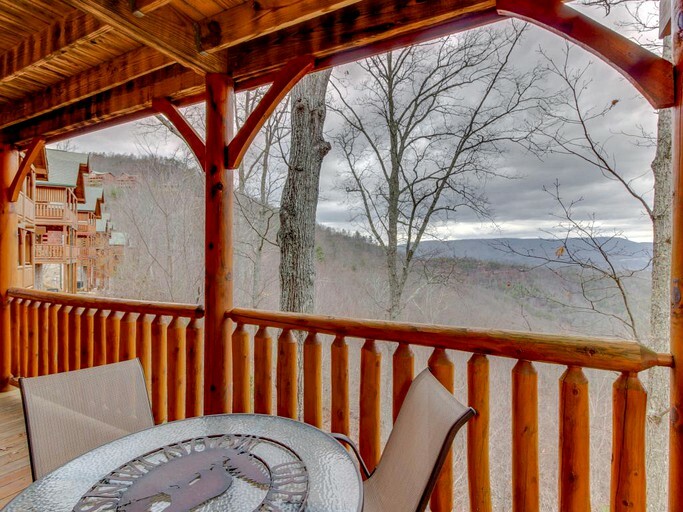 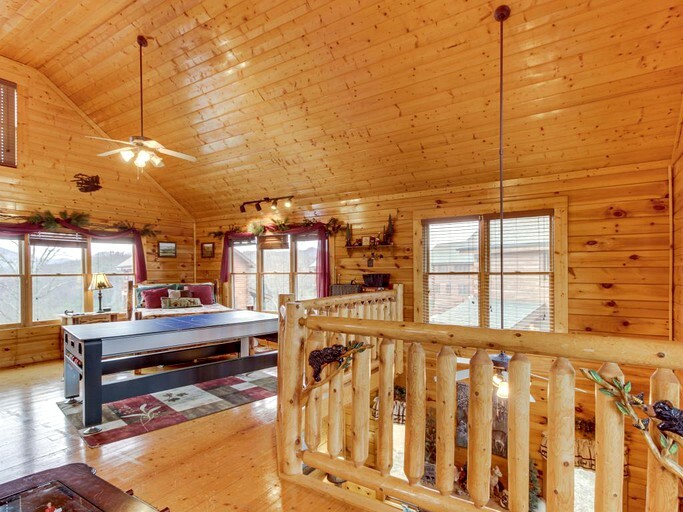 This stunning, family-friendly cabin in Sevierville, Tennessee, provides absolutely incredible views overlooking the mountains. 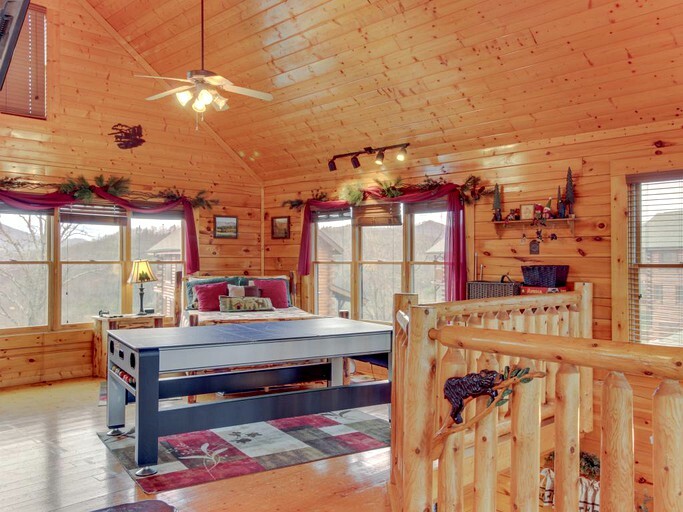 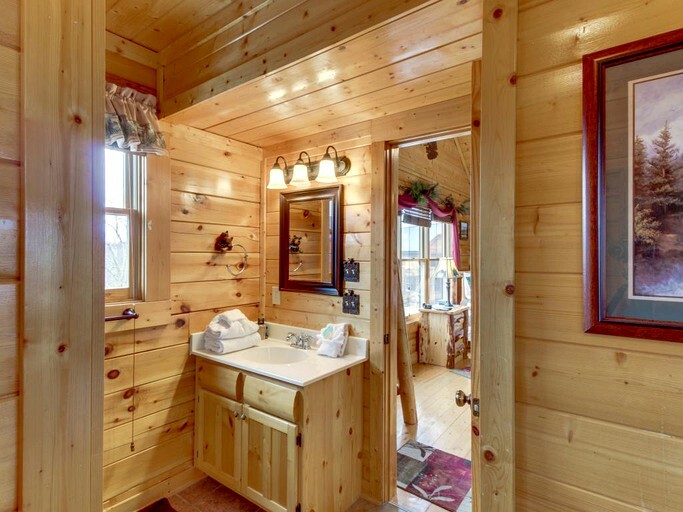 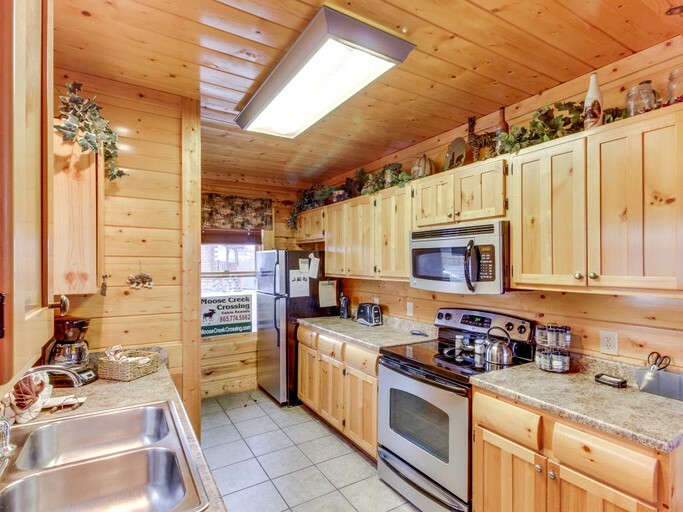 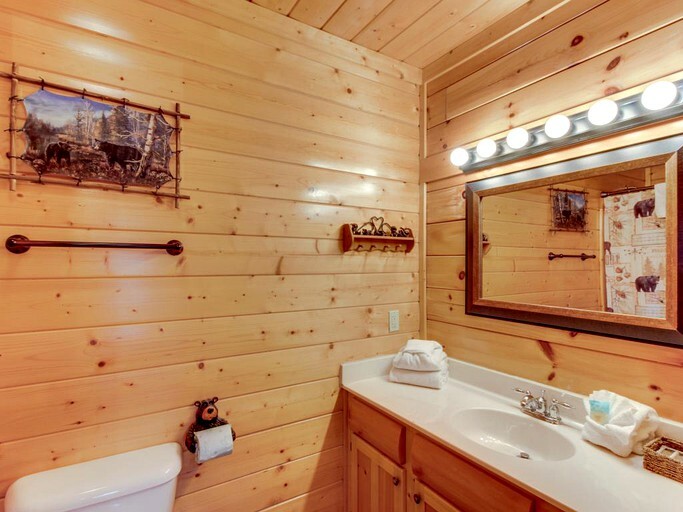 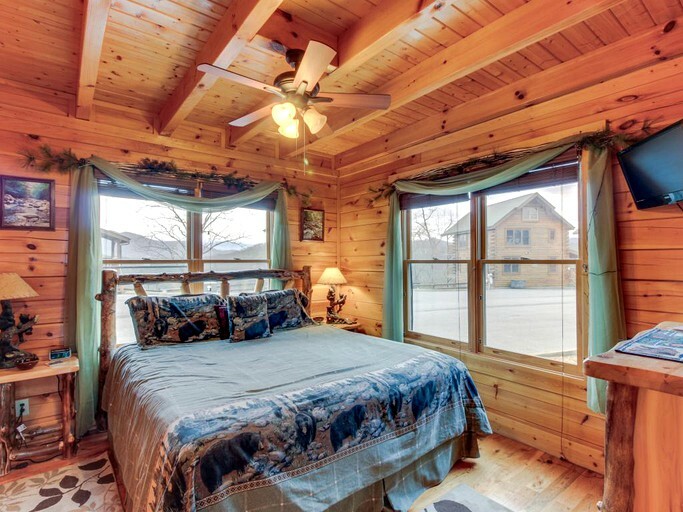 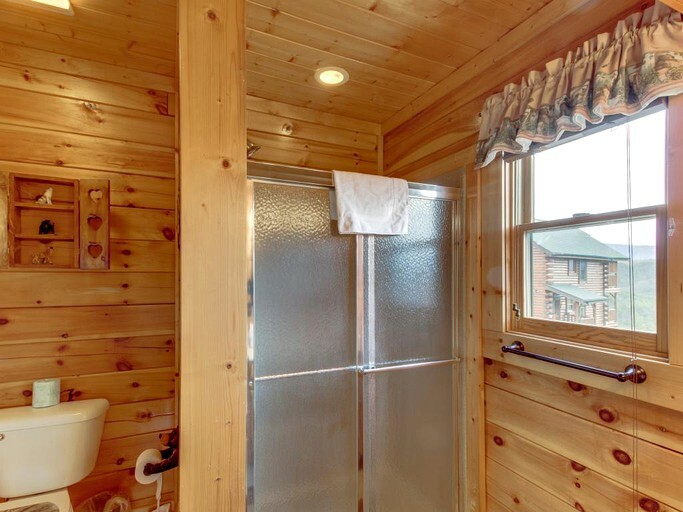 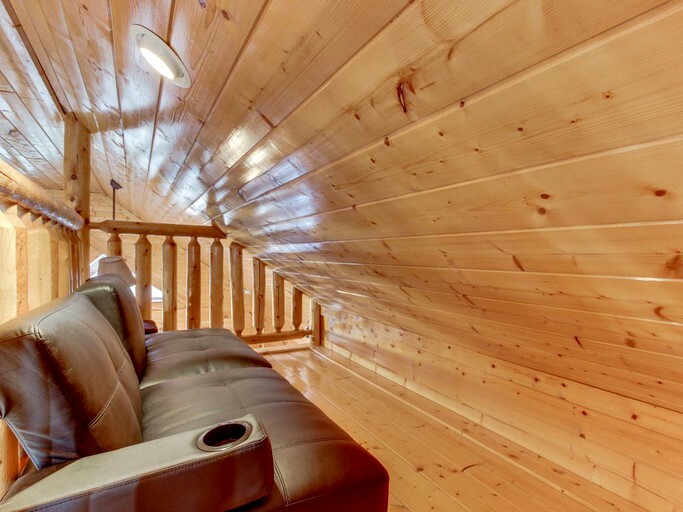 A large cabin with sleeping space for up to eight people, this is the perfect location for a family getaway. 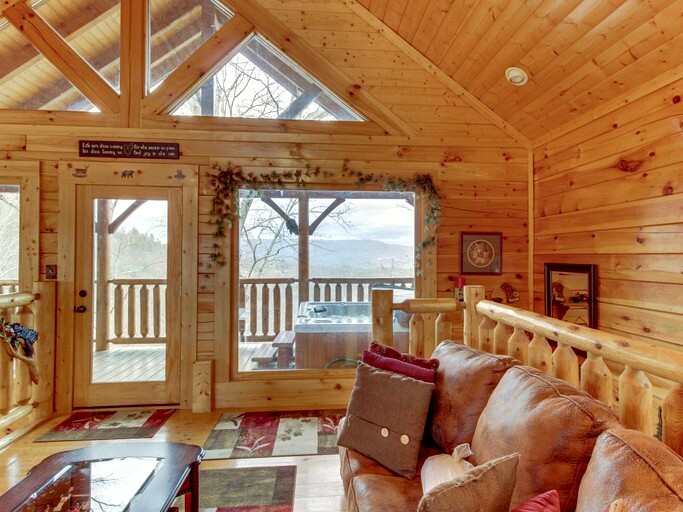 Lots of windows, two porches, and high vaulted ceilings allow for plenty of natural light to illuminate the rooms in the daytime, while wood accents and fun bear decorations make a cozy home-away-from-home. 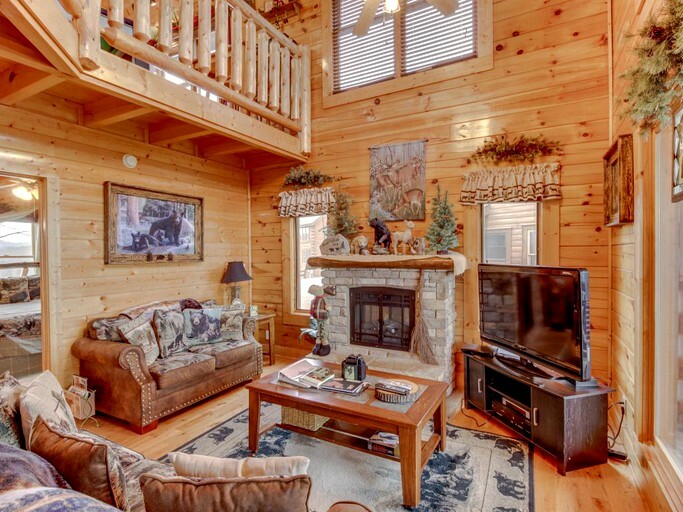 The living room houses a cozy electric fireplace available year-around, with comfortable couches and a cable flat screen HDTV so that guests can enjoy a relaxing, warm evening in. 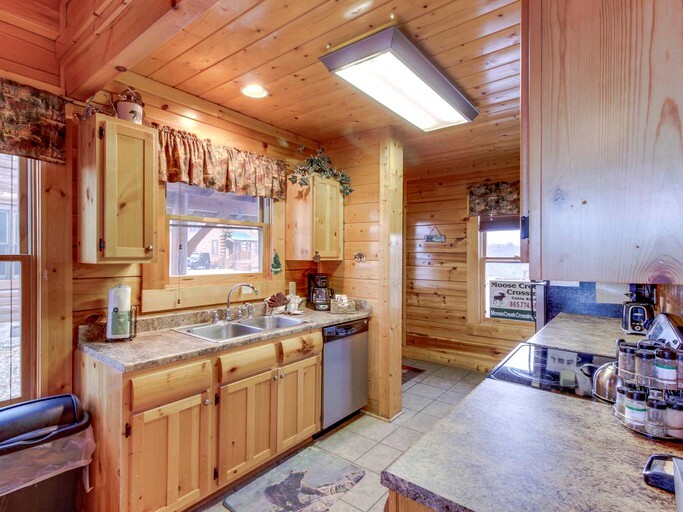 A modern kitchen comes fully equipped with stainless steel appliances, including a convenient dishwasher. 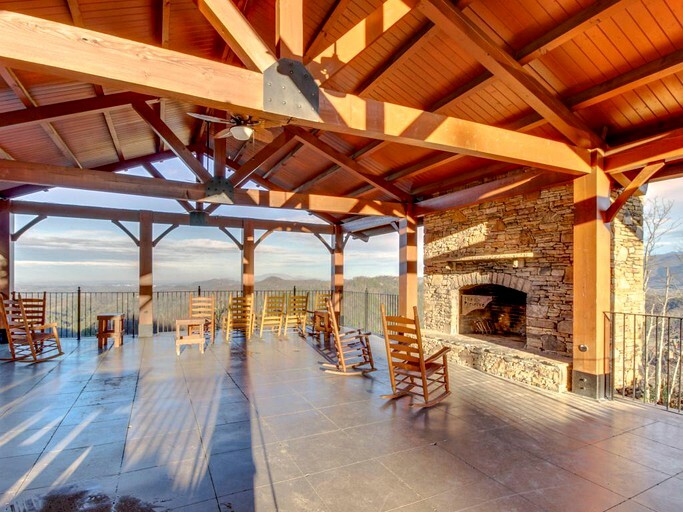 Outside on the porch, a charcoal grill is available and overlooks the breathtaking views. 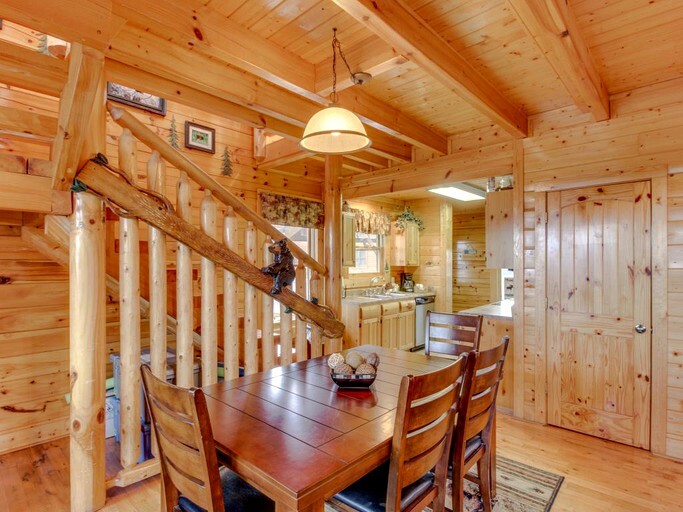 A dining area for four sits next to the full kitchen, while comfortable seating is outside on the porch so guests can choose where to enjoy their meals. 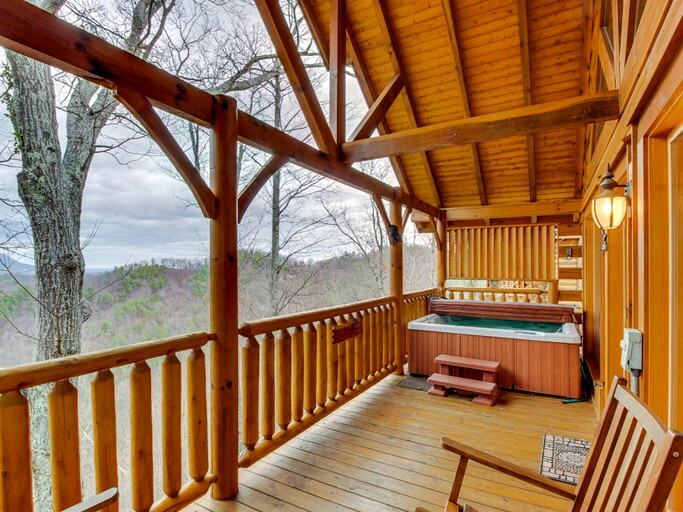 Also on the deck is the six-person hot tub, where guests can enjoy a relaxing soak while they watch the sun go down. 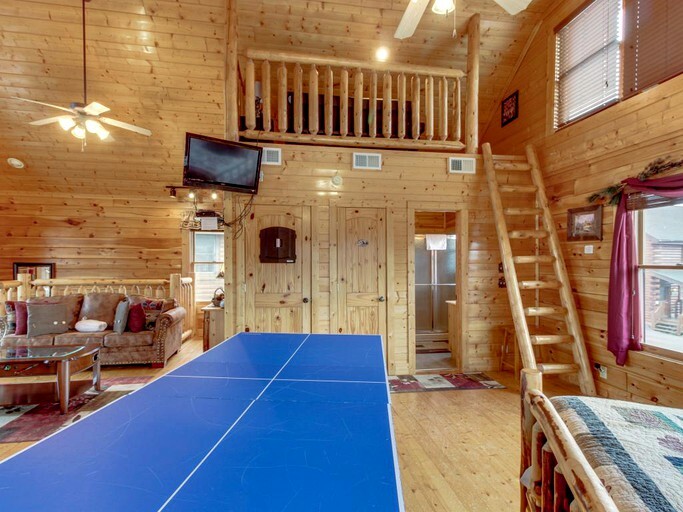 In the loft upstairs, guests can choose from the range of entertainment options including an air hockey table, billiards, ping pong, foosball, darts, or board games. 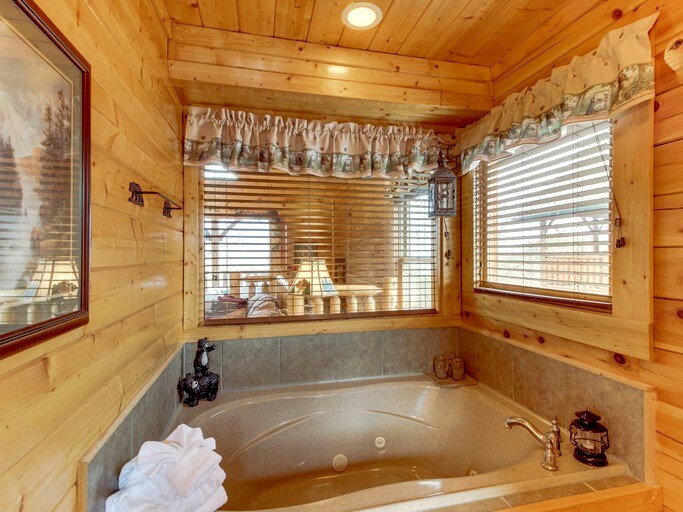 A six-person private hot tub and two jetted tubs to soak in will leave guests with plenty of options during the warm and cool months! 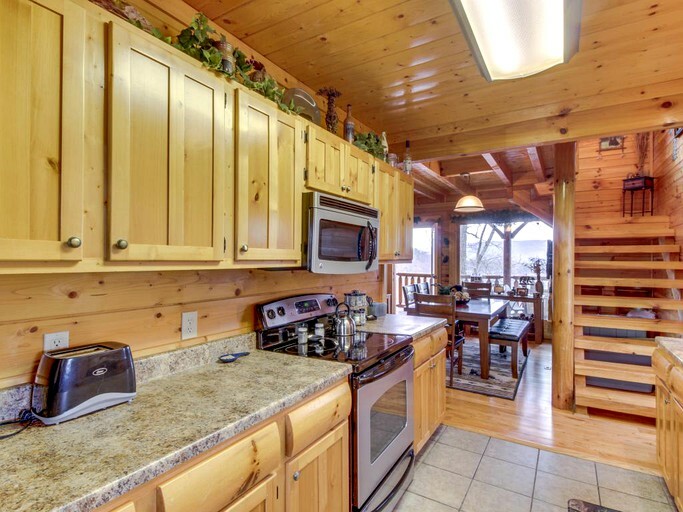 Wi-Fi is available throughout the cabin and on the porches so that guests can keep up with the outside world while enjoying their stay. 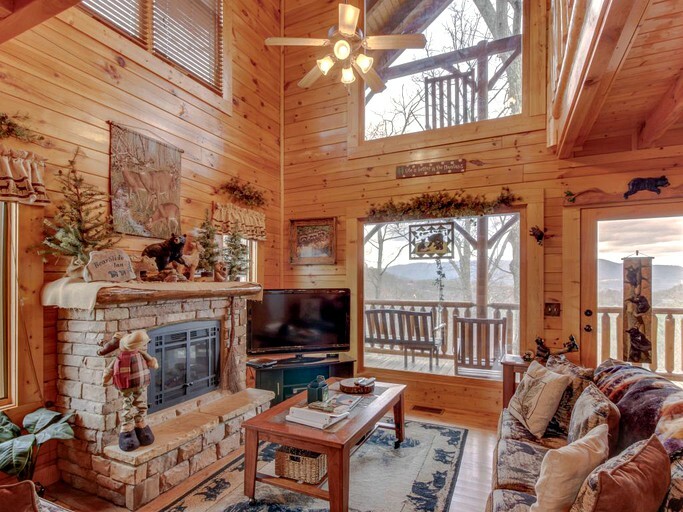 Additionally, a cozy fireplace is available all year to keep the atmosphere cozy and the guests warm. 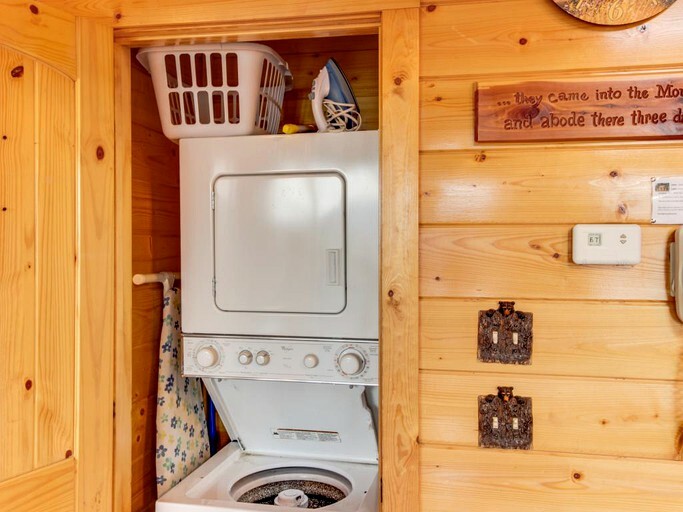 A washer/dryer, and an outdoor charcoal grill are available for convenience. 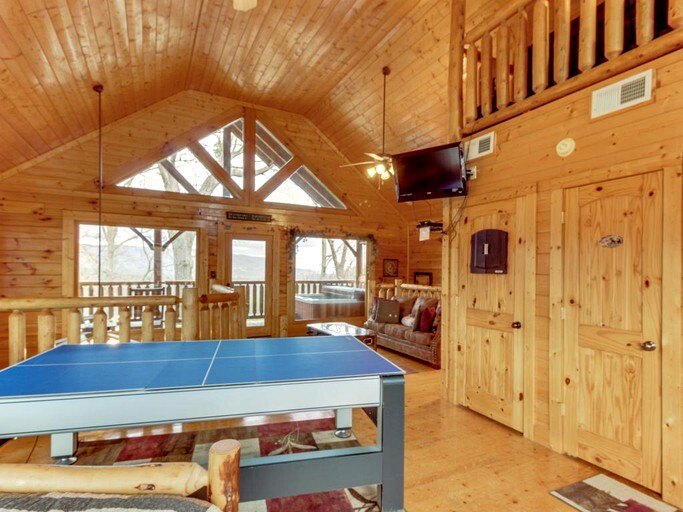 A seasonal pool is available and is shared by the community, as is a shelter house with a fireplace, a fitness center, and a sauna located in the clubhouse. 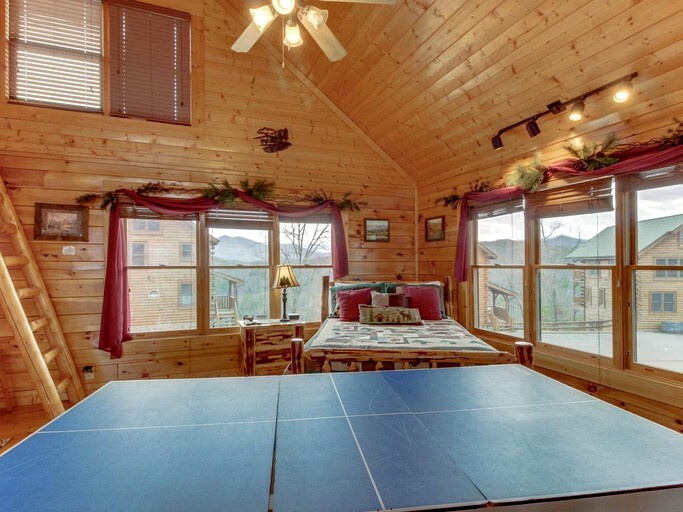 With so many great entertainment options around, it will be hard for guests to decide where to spend each day! 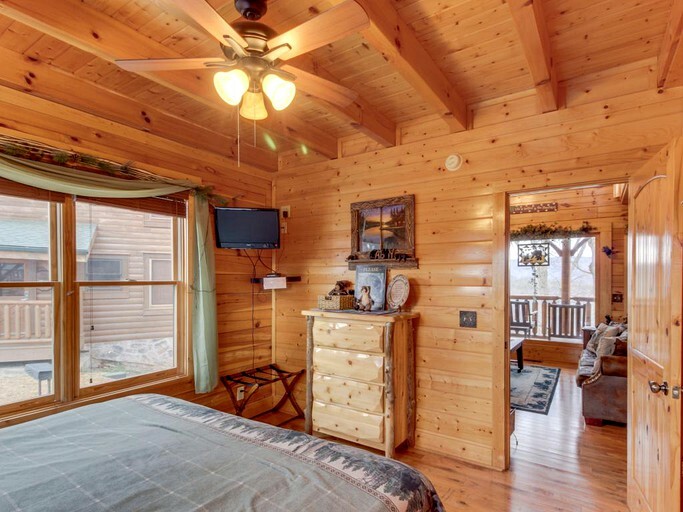 Dollywood, made famous by Dolly Parton, will provide great fun for the family. 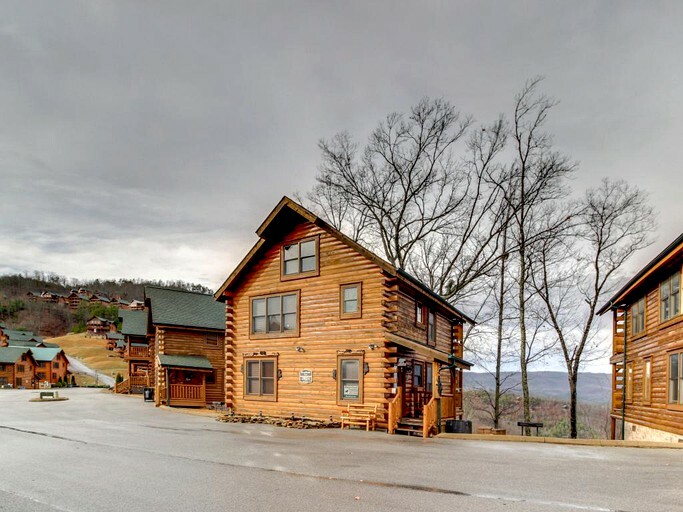 Forty rides, entertainment, and food will keep everyone busy, while Splash Country Water Park is perfect for hot summer days. 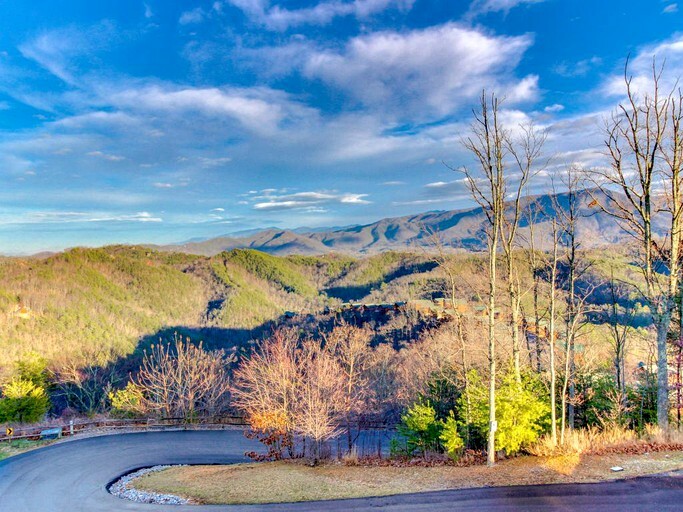 The Great Smoky Mountains National Park is a must-see, where guests can explore hiking trails, or see the diverse wildlife and stunning waterfalls. 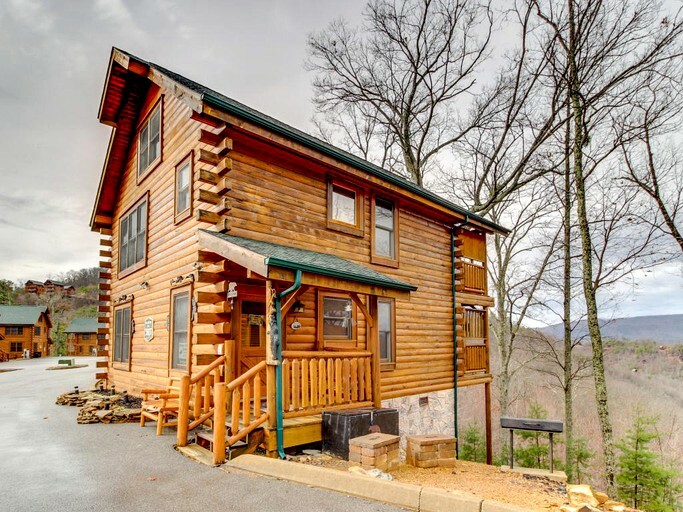 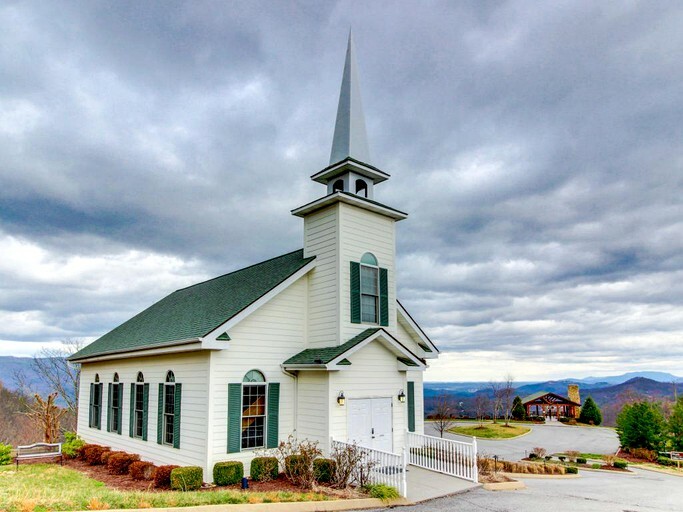 For something a little bit more laid back, guests can visit Pigeon Forge and find plenty of places to grab a meal and a live show. 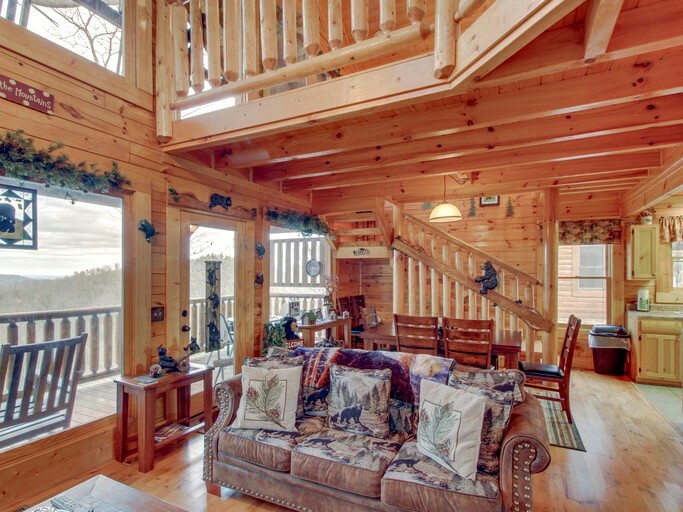 The Island in Pigeon Forge is a multi-level complex complete with live music, retail stores, games, and restaurants. 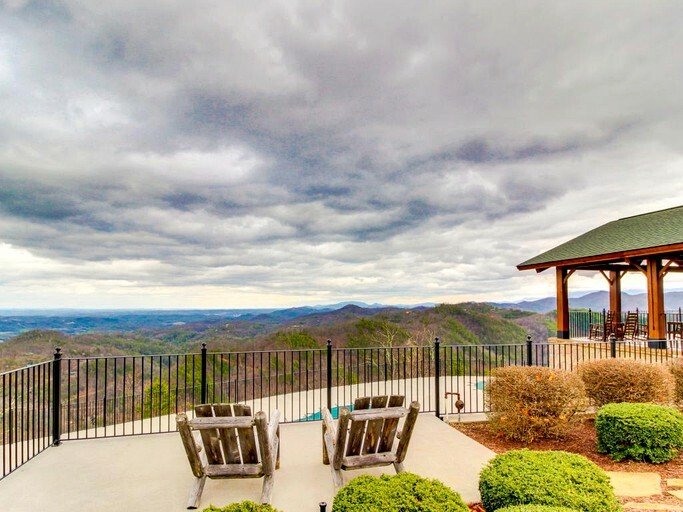 For days where guests want to spend time a little closer to home, nearby family-friendly activities range from zip-lining, horseback riding, hiking, wildlife-watching, and golf. 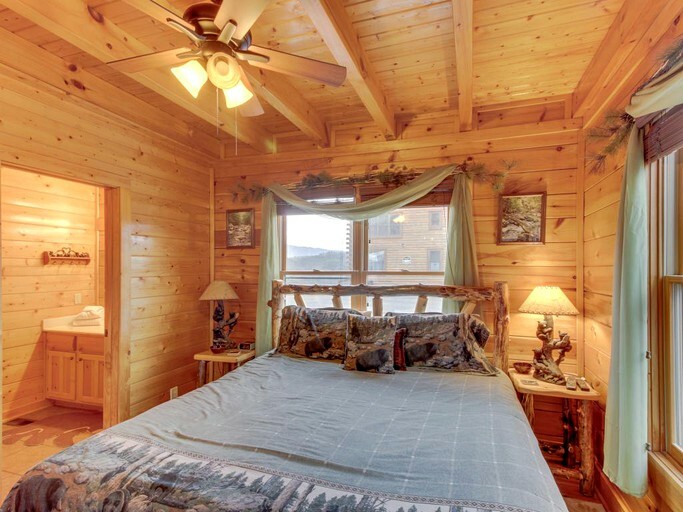 A nightly pet fee is incurred and dogs must only be up to 20 pounds.